Shirley A. (Luckenbill) Williams, 81, of Kutztown, died Sunday, January 13, 2019, in Lehigh Valley Hospital, Salisbury Township, where she was admitted earlier in the day. She was the wife of Robert A. Williams with whom she shared 65 years of marriage. Shirley, a daughter of the late Robert G. and Alice R. (Sensenderfer) Luckenbill, was born in Perry Township, Berks County on April 2, 1937. 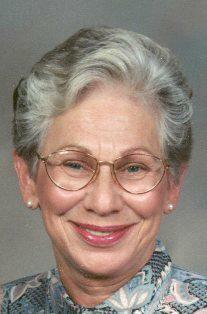 She was a lifelong member of Saint John's United Church of Christ, Kutztown. Shirley first worked in the garment industry at a small blouse factory in Kutztown before joining Western Electric, Laureldale, where she was employed for almost 30 years, retiring in 1989. During her time at Western Electric, she proudly served as a shop steward for International Brotherhood of Electrical Workers (IBEW) Local 1898, Reading. In addition to her husband, Shirley is survived by sons, Terry L. Williams, Sinking Spring; and Allen R., husband of Janet Williams, Dover, NH. Other survivors include a sister, Nancy, wife of Forrest Mengel; and a brother, Robert Luckenbill, both of Fleetwood, as well as numerous nieces and nephews. “Nana” adored her four grandchildren: Erin K. Powell, Laura Jay W. Grove, Katherine L. Hydro and Kevin M. Williams; and her two great grandchildren: Gavin A. and Cora M. Hydro. Shirley was predeceased by a sister, Ethel Rader and a brother, Ernest Luckenbill. When her boys were young, she was active in Scouting and had a reputation as the loudest cheerleader at their sporting events. Shirley enjoyed gardening and crocheting in her spare time. She was a beloved wife, mother, and Nana whose greatest joy was being with and caring for family. Funeral Services for Shirley will be held on Monday, January 21, 2019, at 10:30 a.m. from Ludwick Funeral Homes, Inc., 333 Greenwich Street, Kutztown, with Reverend Scott M. Sanders, officiating. Interment in Laureldale Cemetery. There will be a viewing from 9:30 to 10:30 a.m. Monday in the funeral home. In lieu of flowers, contributions may be made in Shirley's memory to the American Cancer Society, Lehigh Valley Chapter, 3893 Adler Place, #170, Bethlehem, PA 18017. Shirley was a 40+ year cancer survivor. Ludwick Funeral Homes, Inc., Kutztown, is in charge of arrangements. Memories and condolences may be recorded at www.ludwickfh.com. Shirley and I became friends when we frequented the Airport Dinner around 2006 to the present, even after I moved out of state. We still got together whenever I returned to PA. Our breakfast group grew to a group of ten and occasionally one or two more. We shared many great laughs and celebrated a lot of birthdays. I will miss you very much. I love you Shirley.